New immigrants light tonight's candles with Prime Minister Netanyahu and his wife, as well as Jewish Agency chairman Natan Sharansky. Prime Minister Binyamin Netanyahu and his wife Sarah lit the seventh candle of Hanukkah Monday night with new immigrants from all over the world who had made aliyah to Israel in the past year. "This year we have witnessed the largest aliyah in 10 years and counting," Netanyahu said. "I welcome you all to the land of Israel and the State of Israel. May you be blessed and may many more follow you." While addressing the immigrants, Netanyahu stated that that there are two reasons why immigration to Israel has increased. "One is good and one is bad," he emphasized. "The bad reason is the growth of anti-Semitism in the world. We see that, for example, in Europe, there is a wave of anti-Semitism stemming from growing Islamization. Jews understand that Israel is a safe haven for all Jews in the world. "There is also a second reason, and it is good, and that second reason is that Israel is a good country to live in," Netanyahu said. "We heard a statistic today that unemployment has dropped, and that unemployment in Israel is almost the lowest of all countries in the Western world." "I congratulate you that you have decided to take your destiny into your hands and to join your fate to that of our nation's. You have done a great deed. I salute you," Netanyahu lauded the crowd. Jewish Agency Chairman Natan Sharanky also spoke at the ceremony. 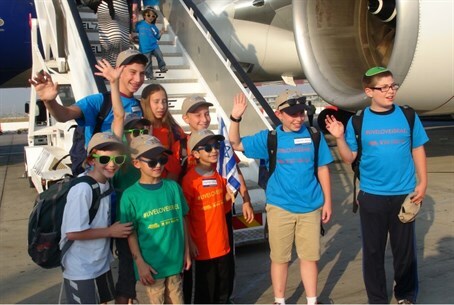 "Today a plane with 200 immigrants from Ukraine landed in Israel. They join 25,000 immigrants who have arrived since the beginning of 2014 - an increase of 35% from 2013." "For the first time most of the immigrants come from the West, the free world. The reason they chose Israel is their desire to live in their home," Sharanky added. "The Israeli government and the Prime Minister supported immigration even during the struggle over the budget. This should be maintained as we expect to see an increase of immigrants from France, Ukraine, and the rest of of the world," Sharansky stressed. "Every Jew who comes to Israel closes a cycle of 2,000 years. Your fathers prayed, cried, hoped - and you have come to Jerusalem."